Citation: Ikemoto S, Matsuura R, Hamano SI, Daida A, Kubota J, et al. (2018) Elevated Serum MMP-9 and MMP/TIMP-1 Ratio in Patients with Migrainous Infarction and Hemiplegic Migraine. J Neurol Neurosci Vol.9 No.6:278. doi: 10.21767/2171-6625.1000278. Introduction: We investigated serum matrix metalloprotease-9 (MMP-9) and tissue inhibitor of metalloproteinase-1 (TIMP-1) levels in patients with acute phase hemiplegic migraine and migrainous infarction. Background: Migraine is a common disorder that is characterized by episodic headaches. Hemiplegic migraine and migrainous infarction are rare migraine-related conditions with unknown pathophysiology. Methods and Findings: We evaluated serum MMP-9, TIMP-1, and the MMP-9/TIMP-1 ratio in patients with migrainous infarction (patient 1), hemiplegic migraine (patient 2), cerebral infarction with other causes (group 3, n=4), and non-organic disease (group 4, n=5). Serum MMP-9 levels were significantly higher in patients 1 and 2 than in groups 3 and 4. The serum TIMP-1 level was significantly lower in patient 1 than in groups 3 and 4. MMP-9/TIMP-1 ratios were higher in patients 1 and 2 than in groups 3 and 4. Conclusion: MMP-9 levels and the MMP/TIMP-1 ratio may aid in the diagnosis of migraine, and therefore may provide a clue to the etiology of cerebral infarction. Migraine is a common disorder that is characterized by episodic headaches accompanied by aura. Cortical spreading depression is a propagating wave of neuronal and glial depolarization in the cerebral cortex that has been implicated in migraine with aura (MA), but cortical spreading depression also occurs in migraine without aura (MO). Cortical spreading depression activates and upregulates matrix metalloproteases (MMPs), including MMP-9. Notably, MMP-9 can alter bloodbrain barrier (BBB) permeability, contributing to the pathogenesis of migraine . MMPs are a family of zincdependent enzymes that degrade extracellular matrix proteins and are involved in BBB maintenance. They are inhibited by tissue inhibitors of metalloproteinases (TIMPs). The MMP-9/ TIMP-1 ratio reflects the disruption of the BBB; however, this observation is controversial because a recent magnetic resonance imaging (MRI) study reported no BBB disruption during MO attacks . The pathophysiology of migraine, including that of pediatric migraine, remains unclear. Migraine is a broad-spectrum disorder. The International Classification of Headache Disorders, 3rd Edition (ICHD-3) beta version lists many migraine-related complications, including hemiplegic migraine and migrainous infarction . Hemiplegic migraine and migrainous infarction are rare conditions, such that little is known regarding their pathophysiologies. We retrospectively investigated serum MMP-9 and TIMP-1 levels in patients with acute phase hemiplegic migraine and in a patient with migrainous infarction to assess their pathophysiology, including the alterations in BBB permeability. We compared MMP-9 and TIMP-1 levels among patients with hemiplegic migraine, migrainous infarction, cerebral infarction from other causes, and a non-organic disease. Patient 1-Migrainous infarctions: At eight years of age, the patient experienced severe pulsating headache and conscious disturbance lasting for a few hours but recovered without sequela. She developed recurrent headaches 1-2 times per month. At 12 years of age, she complained of her typical headache attack without aura, accompanied by nausea and vomiting. She had left hemiplegia and conscious disturbance. Left hemiplegia subsided within a few hours, whereas conscious disturbance persisted. Brain MRI revealed a highintensity area in the right frontal and parietal lobes on the use of fluid attenuation inversion recovery, accompanied with diffusion-restriction (Figures 1A and 1B). Serial electroencephalography revealed suppressed background activities in the right cerebral hemisphere in the acute phase. 99mTc-ethyl cysteinate dimer single photon emission tomography showed hyperperfusion in the frontal region on the fourth day of her clinical course (Figure 1C). The examination of cerebrospinal fluid revealed normal findings. Her headache and conscious disturbance resolved without sequela within five days of onset. Brain MRI on the twelfth day of illness revealed normal results. Hyperperfusion in the frontal region on ethyl cysteinate dimer single photon emission tomography disappeared on the fourteenth day of illness (Figure 1D). Echocardiography revealed no patent foramen ovale. She had no family history of migraine. Her blood sample was collected at 7 hours after onset. Figure 1 Brain MRI and 99mTc-ECD SPECT in Patient 1 (migrainous infarction). Diffusion-weighted brain MRI in Patient 1 (migrainous infarction) revealed a high-intensity region in the right frontal lobe on Day 1 (A) and right frontal and parietal lobes on Day 4 (B). 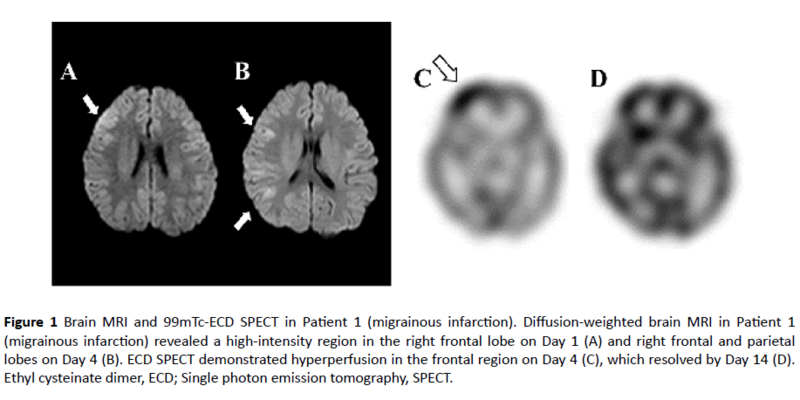 ECD SPECT demonstrated hyperperfusion in the frontal region on Day 4 (C), which resolved by Day 14 (D). Ethyl cysteinate dimer, ECD; Single photon emission tomography, SPECT. Patient 2-Hemiplegic migraine: At 17 years of age, the patient experienced two episodes of visual loss, vomiting, and hemiplegia as an aura with migraine. Subsequently, pulsating headache and conscious disturbance lasted for 1-2 days. She experienced hemiplegia and conscious disturbance, induced by viral infection, at five years and nine years of age. At 12 years and 13 years of age, she experienced conscious disturbance, headache, and visual loss, but recovered without sequela within several days. We diagnosed her with hemiplegic migraine, according to ICHD-3 beta guidelines. Her blood sample was collected at 4 hours from the onset of visual symptoms due to the migraine attack at 17 years of age. Brain MRI findings were normal during her course of illness, and her electroencephalography showed frontal dominant high voltage slow waves during conscious disturbance. She had no family history of migraine and hemiplegic migraine; this was thus a sporadic case of migraine. Serum was separated soon after drawing blood via centrifugation in tubes containing gel clot activator for 10 minutes, immediately pipetted and transferred to dry tubes, and then frozen at -20°C. The serum MMP-9 (92 kDa Pro- and 82 kDa active forms, but not the 65 kDa form) and TIMP-1 concentration (ng/ml) were determined using an enzymelinked immunosorbent assay kit (Quantikine® ELIZA, R&D Systems, Abingdon, UK), in accordance with manufacturer’s instructions. This study was approved by the Saitama Children’s Medical Center Institutional Review Board. Data were analyzed using SPSS (SPSS Inc., Chicago, IL, USA) software for statistical analysis. Continuous variables were compared using the Mann-Whitney U test. Differences were defined as significant at a probability level of p < 0.05. Table 1 shows the patient characteristics. None of the Group 3 and 4 patients had a history of migraine. The cause of cerebral infarction was not detected in the patients of Group 3. The general causes of cerebral infarction in pediatric patients such as viral infection, congenital heart disease, moyamoya disease, collagen disease, metabolic disease and hematologic disease had been ruled-out for these patients. Serum MMP-9 levels were significantly higher in patients 1 and 2 than in the cerebral infarction and non-organic disease groups (1: 1017.6, 2: 1126.8, 3: 352.3 ± 139.8, 4: 223.0 ± 77.9, ng/ml, respectively), as depicted in Figure 2. The serum TIMP-1 level in patient 1 was significantly lower than the levels in the cerebral infarction and non-organic disease groups (1: 78.6, 2: 121.6, 3: 162.0 ± 20.4, 4: 155.5 ± 13.5, ng/ml, respectively). MMP-9/TIMP-1 ratios were higher in patients 1 and 2 than in the cerebral infarction and non-organic disease groups (1: 12.9, 2: 9.3, 3: 2.2 ± 1.0, 4: 1.4 ± 0.5, respectively). Figure 2 Serum matrix metalloprotease-9 (MMP-9), tissue inhibitors of metalloproteinase-1 (TIMP-1) levels, and MMP-9/ TIMP-1 ratio. 1: patient 1 (migrainous infarction); 2: patient 2 (hemiplegic migraine); 3: cerebral infarction by other causes (n=4); 4: non-organic disease (n=5). *: p < 0.05. Table 1 Clinical profiles of patients. The present study revealed an elevated MMP-9 level and MMP-9/TIMP-1 ratio in cases of pediatric patients with hemiplegic migraine or migrainous infarction, when compared with multiple patients with cerebral infarction due to other causes and those with a non-organic disease. These findings may be the key to understanding the pathophysiology of migraine complications, based on MMP-9-induced alteration in BBB penetrability. Elevated MMP-9 levels can distinguish migrainous infarction from cerebral infarction due to other causes. Migrainous infarction occurs as a direct consequence of an MA attack and is characterized by: a) focal neurological deficits lasting more than 60 minutes, and b) an appropriate infarction area observed on neuroimaging . Migrainous infarction was reported to account for 13% of the first-ever ischemic strokes among young patients . Patient 1 fulfilled the criteria for MO in ICHD-3 beta. She never experienced aura. According to the criteria for migrainous infarction in ICHD-3 beta, the presence of aura is essential for the diagnosis of migrainous infarction, which is based on the results of few meta-analyses indicating a two-fold increased risk of cerebral infarction in patients with MA ; however, most studies have shown a lack of association between MO and ischemic infarction. In some reports, the criteria for migrainous infarction is too strict; in fact, there are some reports of cases thought to be MO, where the MMP-9 level was similar between those with MO and MA . These findings indicate that MO may lead to migrainous infarction. Some patients with hemiplegic migraine were suspected of having acute encephalopathy or cerebrovascular disease, because of the acute onset of neurological deficits including conscious disturbance, hemiplegia, and convulsions. Although we did not compare MMP-9 levels to those in the encephalopathy group, MMP-9 levels may be helpful for the diagnosis of hemiplegic migraine. Further studies are necessary for clarifying the significance of our findings. This research was supported by a grant-in-aid for the Kawano Masanori Memorial Foundation for Promotion of Pediatrics and Research on Measures for Intractable Diseases. Gursoy-Ozdemir Y, Qui J, Matsuoka N, Bolay H, Bermpohl D, et al. (2004) Cortical spreading depression activates and upregulates MMP-9. J Clin Invest 113: 1447-1455. Hougaad A, Amin FM, Christensen CE, Younis S, Wolfram F, et al. (2017) Increased brain stem perfusion, but no blood-brain barrier disruption, during attacks of migraine with aura. Brain 140: 1633-1642. Headache Classification Committee of the International Headache Society (2013) Cephalalgia. In: The international classification of headache disorders. (3rd edn). London: Sage, UK. Etminan M, Takkouche B, Isorna FC, Samii A (2005) Risk of ischemic stroke in people with migraine: systemic review and meta-analysis of observational studies. BMJ 330: 63. Leira R, Sobrino T, Rodríguez-Yáñez M, Blanco M, Arias S, et al. (2007) MMP-9 immunoreactivity in acute migraine. Headache 47: 698-702.